Starting a garden from scratch is no easy task. But with a little experience, research and green fingers it’s possible to create a beautiful and rewarding space to spend time. A decent site away from trees allows the greenhouse to be orientated with the ridge running East to West. 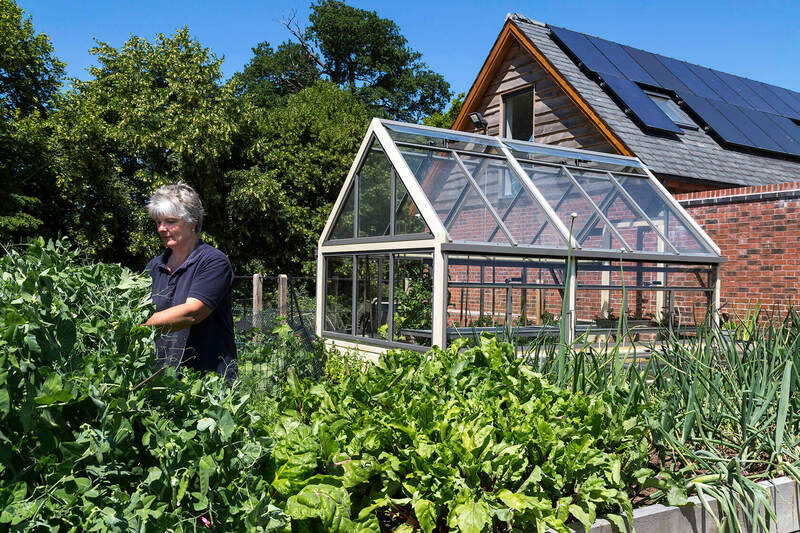 Like the solar panels on the building in the background this will maximise the amount of light in the greenhouse as well as warmth from the sun. Generous space between the large raised beds ensure good accessibility for use of a wheelbarrow around the garden. There’s going to be a few barrow loads of fresh crops by the look of things. 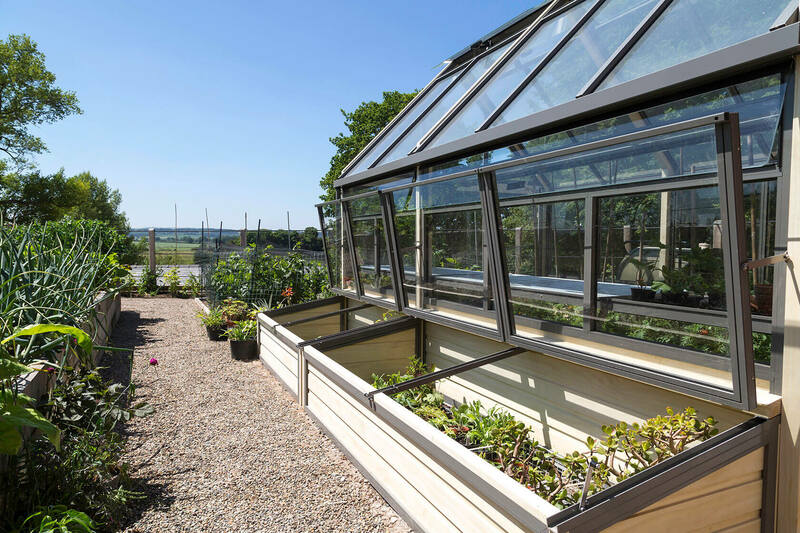 The door on the greenhouse is also wide enough to allow a wheelbarrow through and a low profile door sill (20mm) provides no obstacle. For the seedlings the journey from the greenhouse to the raised beds is very convenient. Travelling by way of the cold frames, perhaps, to harden off prior to planting out. 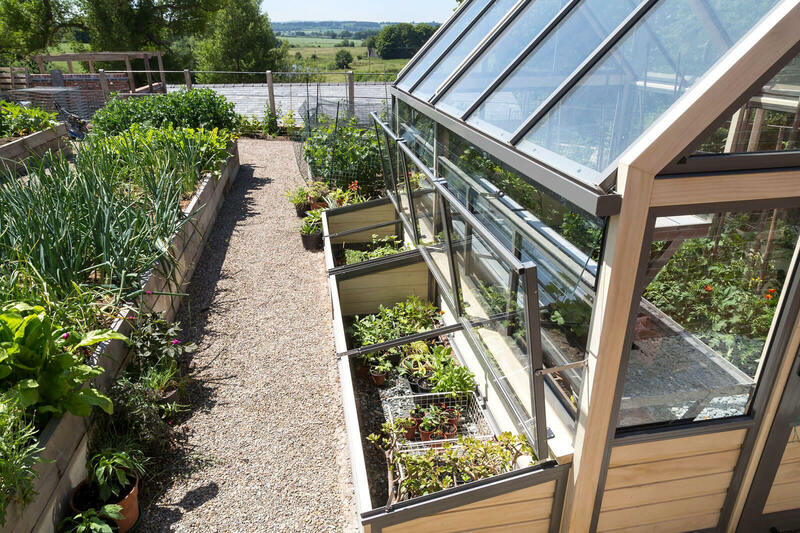 Cold frames can also be used in the summer as an extension to the greenhouse for growing produce such as melons. If you live out in the country it’s not unusual to see precious plants being kept in the frames to keep them safe from any rabbits on the hunt for a tasty meal. Around the garden high brick walls provide a blank canvas for training fruit trees against, choose your style : espalier, fan train or cordons. Lower beds have been created for growing soft fruits, runner beans and peas. Pots have been planted with fresh herbs which are easily transported to and from the greenhouse as the weather conditions change. In the greenhouse tomatoes have been planted directly in to the ground and these have been companion planted with marigolds to discourage any unwanted pests from visiting. This is still a young garden but the basics are all in place. There are many years of enjoyment to come as the fruit trees mature and start rewarding in kind with branches laden with fruit. 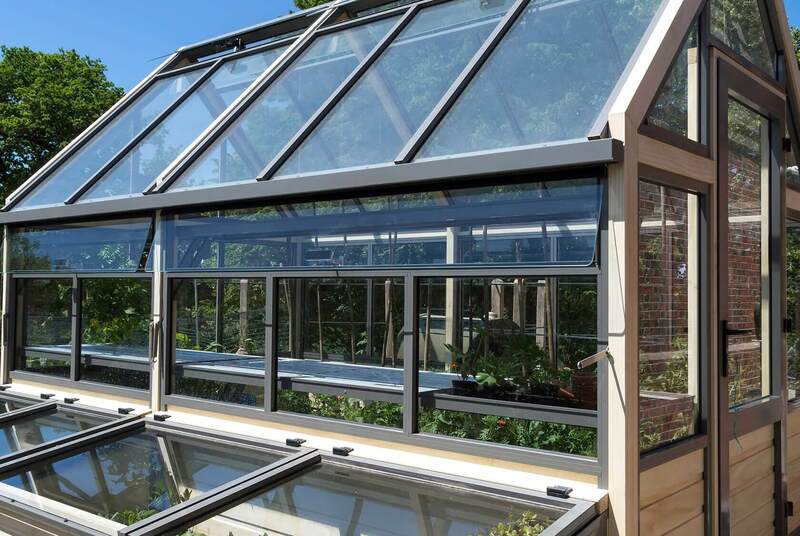 In time the Accoya frames of the greenhouse will fade to a silvery grey along with the waney edged boards on the surrounding buildings. The raised beds are also silvering down so in a matter of a few short years the different wooden elements in the garden will tie in with one another. Like repeat planting this will have a unifying effect, a sense of familiarity.